Five times as manager - a record - guess who's coming for Dinner again? As of April 2018 Barnet Football Club holds a few odd little records like I wager most clubs do – we were the first club to be televised live on the BBC in 1946, we are equal in registering the highest FA Cup win by a Non Leaguer over a League team, 6-1 versus Newport County in 1970, we have won promotion to the Football League three times which is a record too and now we hold another – Martin Allen has been manager of the same football club (ours) on five separate occasions! No other manager has achieved this. 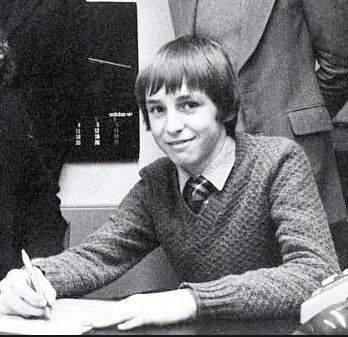 Martin James Allen was born in Reading in August 1965 and is part of the Allen dynasty of footballers – his father Dennis and Uncle Les were professionals as were his cousins Paul, Clive and Bradley. His son and numerous nephews also play. He signed professional terms with Queens Park Rangers in 1983 where he made over 100 appearances and earned two England under 21 caps before a £670,000 move to West Ham in 1989, then managed by Lou Macari. 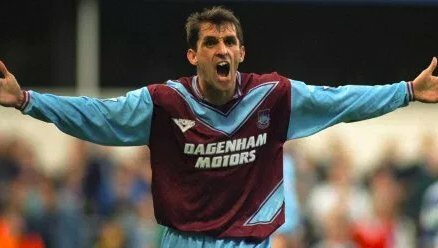 At Upton Park he made over 200 appearances forging the nickname of Mad Dog, a name I'm not convinced he actually approves of as although he had a reputation for fierce challenging and the odd hiccup in discipline with his managers he is remembered at the Boleyn as a fine midfielder who scored a fair share of goals too. In a team including Manager Billy Bonds, and team mates like Don Hutchison, Julian Dicks and John Moncur aggression would have become second nature. 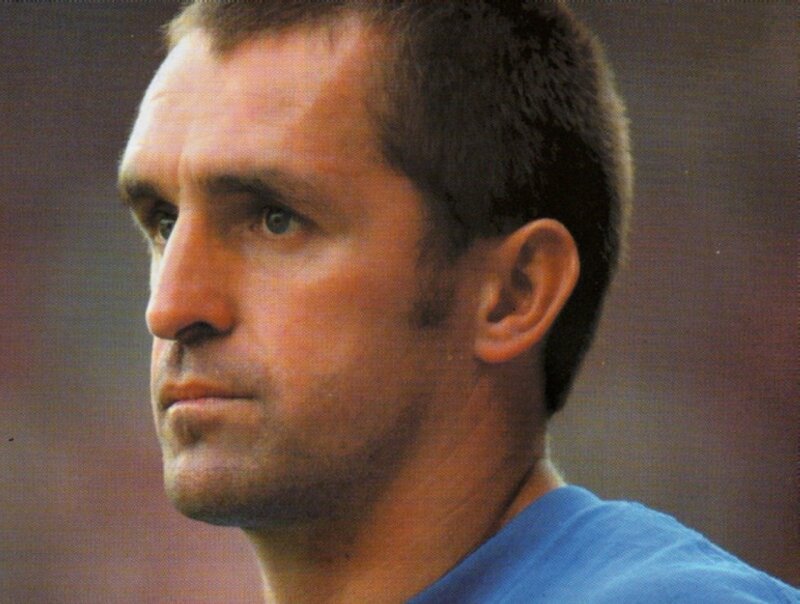 Another Big money move (£500,000) to Portsmouth followed in September 1995 and after a short spell at Southend United Martin retired at 34 to concentrate on a coaching career. As assistant to Alan Pardew at his home club Reading he gained invaluable experience before his first taste of Barnet Football Club in March 2002 as assistant to Peter Shreeves. When Peter left in March 2003 Martin took over the reins and built a new team for the start of the 2003-4 season including Ian Hendon and Simon King. To this day Martin says his shrewdest piece of transfer business ever was the deal involving Junior Agogo moving to Bristol Rovers and securing the signature of goal machine Giuliano Grazioli. “They even gave us money to take him” said Allen. Over this period Martin began to cultivate the infectious relationship he has with club supporters and I for one have always enjoyed his approach to football and indeed his company, argue amongst yourselves if you must! My young son George will never forget being able to ask, on my behalf, would Martin like a drink in the social club at Forest Green Rovers. “I'll have a Coke please young man thank you”. They were Pals. Can anyone who was there forget the day that Martin sent an injured Ian Hendon into the massed ranks of Bees fans at Stevenage? Hendo sat with us and Peter Beadle and Grazioli did the honours in a 2-1 win. With the club riding high in the table Martin completely out of the blue left with only a few weeks of the season remaining much to the disappointment of many Bees followers, leaving Paul Fairclough to guide Barnet, albeit unsuccessfully, into the League Two play offs. So “Go west young man” actually meant to Brentford. Was it the money? Was it the carpet laden office? Was it the new car? Who knows, football life is a merry go round as we at Barnet have come to know fully well. At Griffin Park he kept them safe from relegation and followed that up with two unsuccessful play off appearances and some strong FA Cup runs. Attracting the attention of the media more and more he allegedly swam the River Tees and jumped naked into the Solent all in the cause. He also earned his UEFA pro licence in 2006. In May 2006 he moved to Milton Keynes Dons where he oversaw a League Two play off position but lost out to Shrewsbury Town, and in May 2007 became manager at Championship side Leicester City. Relations with Chairman Milan Mandaric were difficult and Martin's contract was terminated after just 4 games. Always in demand he made numerous appearances on Sky TV as a summariser and continued with his other football interests including schools programmes and his company Pro FC working with young players. He was also Director of the charity Coaching for Hope. In September 2008 he took charge of a troubled Cheltenham Town, coincidently where his father Dennis had managed in the 1970's, but by January he was back at QPR as a scout. The call from Tony Kleanthous came in March 2011 with Barnet near the foot of the League Two table and struggling. “When I got the call it was a no brainer. We are going to have some fun and we are going to stay up!” he said at the time. A five week, eight game temporary contract was hastily arranged. However just three unbeaten games later he was gone again – to Notts County with promise of the carpets, the car plus I suspect more sensibly the incentive to manage full time again. Tony Kleanthous said “Martin felt he could keep Notts County in League One and that would offer him the opportunity to challenge for Championship football the next season. This is something I obviously could not match but I am bitterly disappointed”. Barnet survived, just, thanks in a large part to Giuliano Grazioli's caretaking. Martin saved the Magpies from relegation but was sacked in February 2012 and by April he was back at Underhill once more. With Bees struggling again at the foot of the table after Lawrie Sanchez's rein he was asked to oversee three vital games. Two wins and a 22nd place finish after an emotional win at Burton Albion on the final day of the season kept Barnet up but his short contract had ended. In July 2012 he was appointed manager at Gillingham and at the end of the season the Gills were promoted to League One securing the title. He was awarded Manager of the Year for the division by the League management committee. After 11 games and just two wins of the following season Martin was sacked. 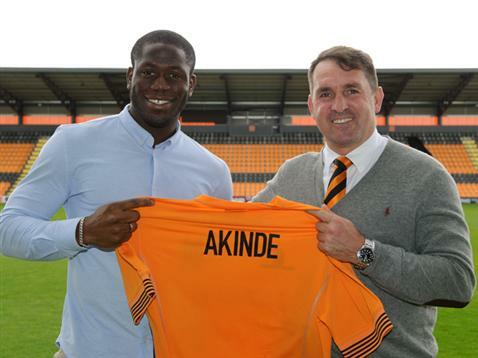 His fourth spell at Barnet, now ensconced at the Hive, started in March 2014. He assembled the side that was to win the Football Conference and be promoted back into the Football League. Retaining the experience of Goalkeeper Graham Stack and finding Captain Charlie MacDonald were shrewd moves. Add to that a midfield including Sam Togwell, Curtis Weston, Luisma Villa and Lee Cook and a defence with the likes of Elliot Johnson, Andy Yiadom, David Stephens and Bondz N'Gala and you have a side to rival most in Barnet's history. However John Akinde was surely an acquisition to even rival that of Grazioli? Consolidation in League Two followed in 2015-16 but by December 2016 with the club just outside the Play off positions Martin made an astonishing request to terminate his contact and take over a National League Eastleigh. Why? Carpets, car and a very decent wage I suspect. Discuss. By February Martin had left Eastleigh winning only two of fourteen games. Barnet's 2017-18 season has been tough. The team had been crippled by injuries early on and that certainly did not help the footballing style of rookie Rossi Eames. Mark McGhee and Graham Westley on the other hand, in my opinion, were frankly never the right men to manage at the Hive. In March 2018 with Barnet rock bottom of the table with 8 games to go, the Chairman looked up his “frequently contacted” list on his mobile and the call went out to Martin. Cue buzz around the whole club and maybe the Manager's office now has a new carpet! A marked improved team performance at Luton was very evident and the 2-1 home win against fellow strugglers Crewe was just the tonic the club needed. The 4-1 defeat at Stevenage however hurt a lot. Who knows what will happen next? Barrow is a long journey as is Gateshead and Hartlepool. I have been to all of them and frankly don't fancy it. So it's easy starting this Saturday it is five Cup Finals. In an E mailed interview for a programme or website I was asked to do as a supporter a few years back one question was; “Dead or alive what three Barnet FC related people from any era would you invite for a Dinner Party?” That is so easy - Barry Fry, the late great Dennis Signy and Martin Allen. Not much food would get eaten that is for sure. Welcome home Martin, for the moment anyway the fire is on and your slippers are warming. Have you flown to Gateshead though Reckless?